Parents are often faced with the decision of whether to keep a sick child home from school. Many factors go into that decision, and parents may weigh those factors in different ways. In October 2016, the C.S. Mott Children’s Hospital asked a national sample of parents of children aged 6-18 about their experiences in deciding whether or not to keep their sick child home from school. Seventy-five percent of parents report at least one sick day for their child in the past year. Parents frequently rate health-related factors – concern about the illness getting worse if the child went to school (60%) and not wanting the child’s classmates to get sick (47%) – as very important in deciding to keep a sick child home from school. These health-related factors are cited more often by parents of younger children 6-9 years compared to parents of older children 14-18 years. Parents also consider what the child may miss by staying home: 37% say that the child missing a test or falling behind in school is a very important factor; this is cited more often by parents of older than younger children. Only 6% of parents say that missing after-school activities is very important. Logistics also influence the decision to keep a child home from school. Eleven percent of parents cite not wanting to miss work as very important, while 18% say not being able to find someone to stay home with their sick child is a very important factor. This is less of an issue as children get older: 32% of parents allow older children to stay home alone when sick, but almost no parents allow younger children to do so. Parents also take into account their child’s specific symptoms when deciding whether to keep them home from school. Most parents (80%) are not likely to send a child to school with diarrhea, but have less agreement about vomiting (58%) or a slight fever but acting normally (49%). Few parents say they are not likely to send a child with red watery eyes but no fever (16%) or a runny nose, dry cough and no fever (12%). The top factors in parents' decision to keep a child home are concern that the illness will get worse or spread to classmates if the child goes to school. Parents are more likely to keep a child home with diarrhea, vomiting or fever, but send a child to school with a cough or runny nose. 2 in 5 parents of high schoolers view missing tests or instruction as a very important consideration in keeping a sick child home from school. Parents often have to make a judgment call about whether their child is too sick to go to school. Results from this Mott Poll show that three-quarters of parents have opted to keep a sick child home in the past year. These decisions encompass a variety of factors including parents’ views of the severity of the child’s illness, concern for other children in the class, logistical factors, and academics. In this poll, the most important factor in parents’ decisions about whether to keep a sick child at home was if the illness would get worse by having the child attend school. The challenge for parents is that in many situations, it is not easy to predict if going to school would have a negative impact. 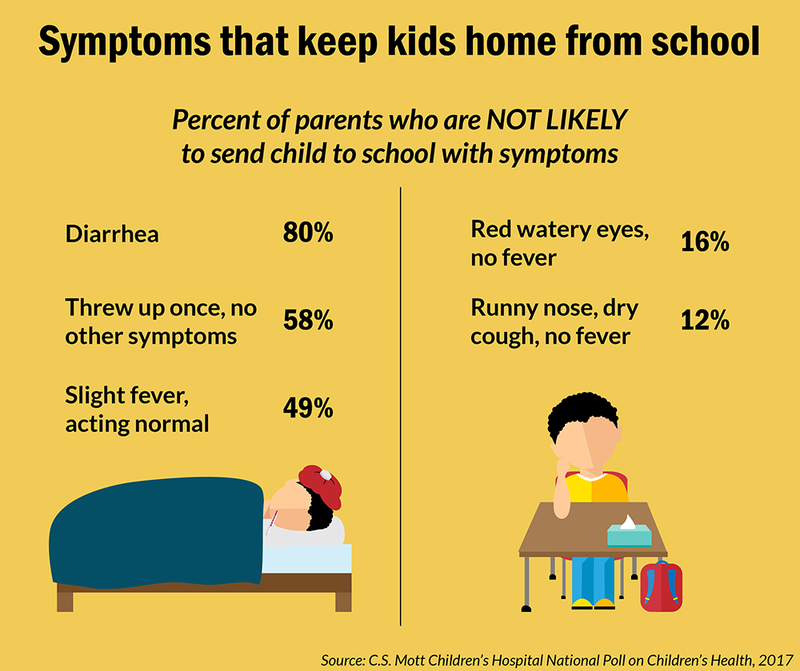 Poll results suggest parents use specific symptoms as a guide: in situations involving diarrhea, vomiting and fever, many parents would keep their child home from school. Parents may identify these symptoms as signals of more serious illness; parents also may recognize that these symptoms can cause significant disruption to a child’s school day. In contrast, familiar symptoms, such as a runny nose or dry cough without a fever, were not viewed by most parents as serious enough to warrant missing school. It also can be hard for parents to predict how long symptoms will last; some minor illnesses can drag on for days or even weeks, while others last only a day or two. A phone call or visit to the child’s health care provider can help parents know whether the child has a serious illness, but may not clarify how long symptoms will last, leaving many parents to make school attendance decisions based on their best guess. These Mott Poll results indicate that another major consideration in parents’ decision about keeping a child home from school was whether the child would cause classmates to get sick – a greater concern for parents of children 6-9 years than parents of children 14-18 years. This age difference may reflect the change in parental responsibility as children move from preschool into elementary school. Often, daycares and preschools have strict rules about when children must be kept home, but parents of school-age children are generally asked to make these decisions on their own. Although many parents face a struggle in balancing home and work, parents in this Mott Poll reported that concerns about missing work were not the primary factor in deciding whether to send a sick child to school. However, 1 in 5 parents said that not being able to find someone to stay home with their sick child was a very important factor in their school attendance decisions. Without a friend or relative to cover the situation, some working parents may feel they have limited options when their child has a minor illness. Nearly 40% of parents noted the importance of their child missing tests or class instruction, particularly for high school-age children. Parents of older children may want to include them in decisions about staying home from school for a minor illness, so that academic considerations are based on accurate information. When the decision is made to keep the child home, parents should ensure that children ask for and complete missed assignments. How do you decide how sick is too sick for school? When should you keep your sick child from school? This report presents findings from a nationally representative household survey conducted exclusively by GfK Custom Research, LLC (GfK), for C.S. Mott Children's Hospital. The survey was administered in October 2016 to a randomly selected, stratified group of parents age 18 and older (n=2,036). Adults were selected from GfK's web-enabled KnowledgePanel® that closely resembles the U.S. population. The sample was subsequently weighted to reflect population figures from the Census Bureau. The survey completion rate was 60% among panel members contacted to participate. This report is based on responses from 1,442 parents who had at least one child age 6-18 years. The margin of error is ± 2 to 5 percentage points. Freed GL, Gebremariam A, Singer DC, Schultz SL, Kauffman AD, Clark SJ. Parents struggle with when to keep sick kids home from school. C.S. Mott Children's Hospital National Poll on Children's Health, University of Michigan. Vol 28, Issue 3, January 2017. Available at: http://mottpoll.org/reports-surveys/parents-struggle-when-keep-sick-kids-home-school.